Select references are available in the print book. 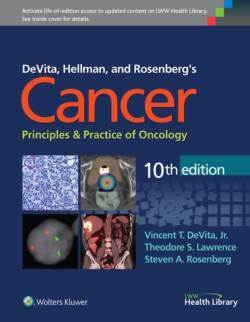 ALL REFERENCES FOR DeVita, Hellman, and Rosenberg's Cancer: Principles & Practice of Oncology, 10th edition ARE AVAILABLE ONLINE AT LWWHealthLibrary.com/oncology." DeVita, Hellman, and Rosenberg's Cancer: Principles & Practice of Oncology, 10th edition has garnered universal acclaim as the world’s definitive, standard-setting oncology reference . More than 400 respected luminaries explore today’s most effective strategies for managing every type of cancer by stage of presentation - discussing the role of all appropriate therapeutic modalities as well as combined-modality treatments. This multidisciplinary approach will help your cancer team collaboratively face the toughest clinical challenges and provide the best possible care for every cancer patient. Access the complete contents online or on your mobile device , with quarterly updates reflecting late-breaking developments in cancer care on LWW Health Library. Take full advantage of the latest advances with brand-new chapters on Hallmarks of Cancer, Molecular Methods in Cancer, Oncogenic Viruses, Cancer Screening , and new sections on Genetic testing and counseling for cancer, plus comprehensive updates throughout – including coverage of the newest biologic therapies . Access and receive quarterly content updates for Cancer: Principles and Practice , 10th Edition on the NEW and ENHANCED LWW Health Library while on the go. Additionally, for the first 6 months, Cancer: Principles and Practice of Oncology , 10th Edition purchasers will get access to the entire Oncology Collection on LWW Health Library – an incredible value at no additional charge!